a-z collective is comprised of two multi-disciplinary fine artists, Amanda McKinney Sparrow and Zorica Silverthorne. Themes of space, time and nature draw these two artists together. Their work encompasses a variety of media, utilizing both traditional and contemporary techniques. 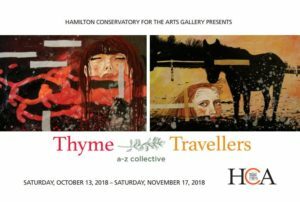 The exhibition, Thyme Travellers, explores the historical processes of natural dyes, inks & paint. Inventive sourcing of matter, collecting weeds, flowers and herbs, creating their own naturally derived mediums. Using the natural pigments in classical and experimental ways. These organic living materials yield unique, beautiful colours that may change over time. Don’t miss the HCA Concert Series featuring the Zemlinsky Quartet at 2pm prior to the a-z collective exhibition opening. Click HERE for ticket info.